Sol is a creative agency theme with nice css3 animations and 100% responsive design that adapts well on all mobile devices. 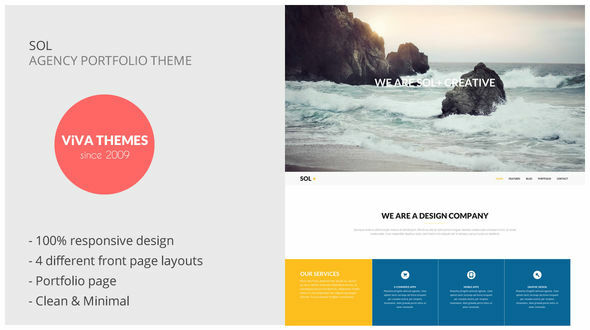 The theme comes with an attractive portfolio display, a team members page template and many other attractive features. Below the services section in the front page you can display the team member’s section like in our demo, your blog, portfolio or a static page. - Compatible with the latest WordPress version. - Team members page template. - Full width page template. - Four different front page layouts. - Three widget ready sections. - Integrated social media font icons, 11 icons available. - Styling for Contact Form 7 plugin. - Custom styled css elements. - Easily upload your logo image. - Compatible with all major browsers. - Delivered with .png source files.